Thought I would ask the experts on this forum the way forward on this one. My 1936 Light 12 has a broken stud that is firmly corroded into the block. (wet liners) as in the photo. I could attempt to drill out the thread, but what to do with the broken side? If there is enough metal, maybe drill the hole deeper and re-thread and not worry about the break. Get it stitched and re-drilled...what do you think? Close-up of broken thread and break at side of chamber. Thanks for your ideas and suggestions. Oh dear, that is sad. Best fix is a replacement block. The engine really needs to come out anyway, it needs to go into a machine to drill that stud. The chances of getting it with a handheld drill are about one in a hundred. On a good day. Toolmakers use a spark eroding machine which is the optimum in this case, there might be an engine machinist with one. That stud is rusted in enough to screw the stud off, that is about as difficult as they get. Dealing with the missing metal is a whole other problem but only you can decide how to remedy that according to how much you want to spend, and what standard you work to. 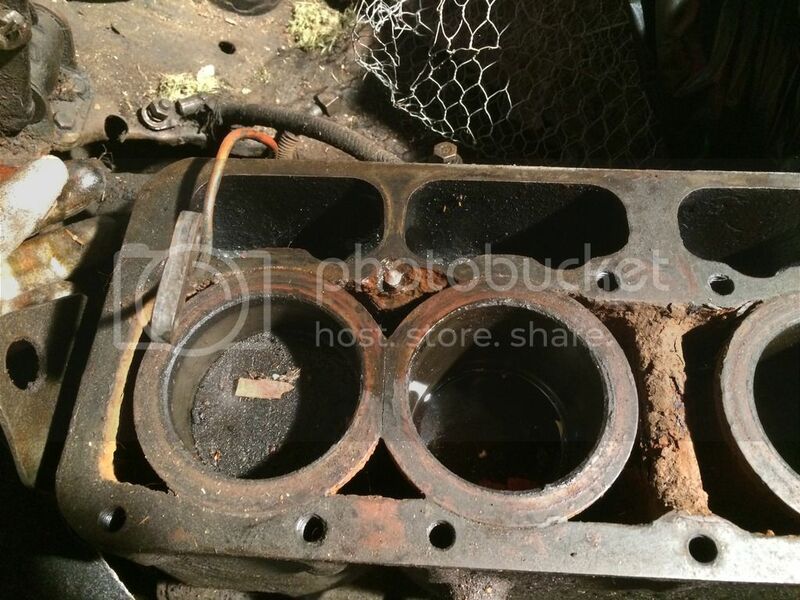 The liners seem to be flush with the block, may be the photo, but if they do not protrude at least three thou the head gasket might not seal. Might need to pull the liners and re-shim them. Whatever happens get some top of the line coolant. Go to a lorry or tractor dealer, they have the best stuff because they deal with motors that will not last without it. Would have prevented your troubles. Hope you can find a replacement. I have seen a similar thing done with broken studs on large water pumps. 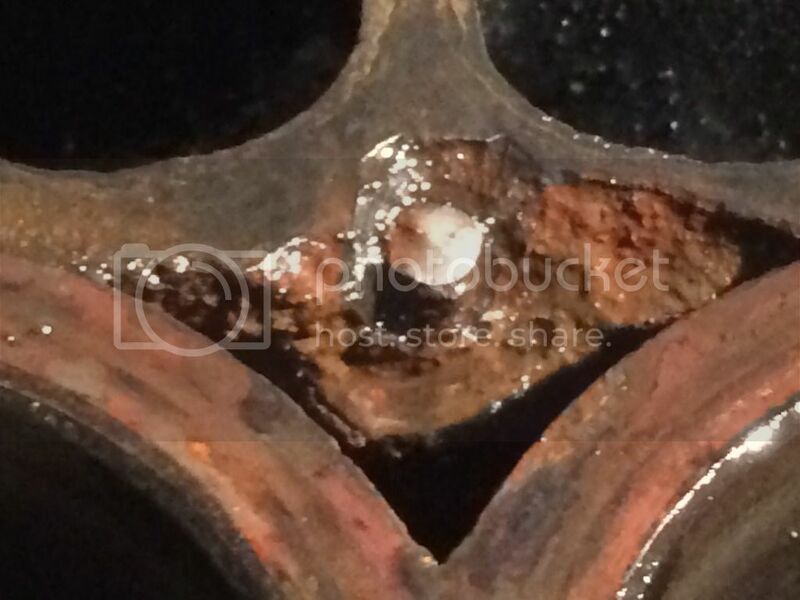 Sometimes a slight leak would cause the stud to rust and erode, so when loosing the nut, or sometimes a bolt, it would shear at the eroded part. Instead of the washer/nut spanner/wrench, a piece of steel bar about 2ft long (2 x 1/2) or similar, with a hole that fitted tight over the stud (as per the washer), but with a large diameter countersink on the outer side to allow room for the welding rod (arc welding). The idea was to shock the stud via the steel bar bar, one person hitting the top of the stud, not too hard and the same time another hitting the steel bar, first in a tightening direction and then in the other. Heat was often applied to the pump casing a slight distance from the stud. Repeated clockwise and anti clockwise without being too greedy. If you can afford it / find it, get it spark eroded. Otherwise I have had success by welding a large nut to the stud and then winding it out. If that fails, you can still fall back to spark erosion. I would talk to a local garage or engineering firm first who has had some experience of this sort of work. It will come in handy even if you never use it. I don't see why you would need to use a spark eroder on a soft metal stud when it can be drilled carefully to almost the tapping size. I've only used a spark eroded on broken off taps. It needs clamping on a radial drill table and drilling accurately but looks in a very sorry state. either get it to machine shop and see what they can do ..
just spoke to my dad , who had very similar problem on his Morris 8 block , luckily he has a big pillar drill , and drilled down stud dead centre , then opened drill hole to exact size of thread, then picked out thread bits with sharp pointer..
Had a similar problem with a manifold bolt on the Zodiac. Drilled it, tried an easy-out....... Snapped the easy-out! We went for spark erosion and luckily found a machine shop in Ystrad Mynach.